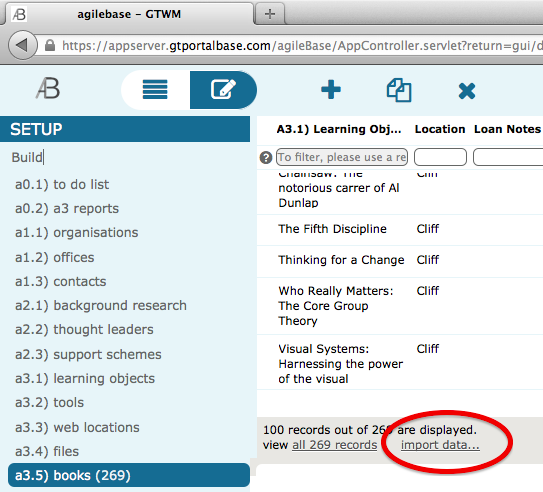 agileBase allows data to be imported from CSV (Comma Separated Variable) files. Excel, OpenOffice and other spreadsheets can save data in this format. You’ll need MANAGE privileges on the table you wish to import into. Select that table from the ‘Build’ section, scroll to the bottom of the data and click the import link to start. Data can be imported in two ways. Inserting new records will create a new record in the database for every line in the CSV file. Updating existing records will attempt to match each line in the file with an existing record and update all field values from the CSV. This can be useful when merging in data from an external source, or exporting, altering with a third party system and re-importing. Another use can be updating one field based on another – you can export, update the fields as necessary and re-import. Updating existing records is particularly useful when records in other tables depend on the data in the table being imported into, so you can’t delete the data. In either case, the CSV file must contain fields in the same order as they are in the table being imported into. The column titles don’t need to be the same though, it’s the order which is important. When updating records, a key field must be selected to match records up. This can be any field that has the ‘unique’ property set. Alternatively the internal agileBase rowID can be used. This field is included as the first field in any data export. For a file field, please leave an empty column in the spreadsheet in that position. If you wish to do a bulk upload of many images, please contact support. For separator and cross-referenced fields, don’t include a column as they contain no data.